is coming soon to BBC America. They haven’t posted a premiere date at their web site, but they now include it in their previews of upcoming programming. I’ve read about the series, now in its second season, and look forward to finally seeing it. Amazon Kindle E-Books: Gay Fiction Chart. Only Armistead Maupin’s Michael Tolliver Lives is currently keeping Degranon: A Science Fiction Adventure from the number one spot in Amazon Kindle’s Gay Fiction chart. Vintage: A Ghost Story is currently #3; it’s by Steve Berman. I haven’t read Vintage, but I love Berman’s supernatural fiction collection Trysts. Another gay scifi novel, Toby Johnson’s Secret Matter, is currently #18. Secret Matter usually leaves all of my books way behind; it sounds fascinating, and it’s definitely on my reading list. The Acorn Stories, one of my non-genre books, has dropped down to #39, after a short visit to the top 20. Dear Jesse. Distributed by Sovereign Distribution. Reviewed by Duane Simolke for ThisWeekInTexas.Com. Some people remember this film because its PS features an interview with Matthew Shepard and his African American boyfriend, not long before Shepard’s murder. Many other viewers just liked seeing Senator Jesse Helms (R-NC) exposed for his subtle racism and gleeful homophobia. However, Dear Jesse actually balances the focus on Helms with an exploration of director Tim Kirkman’s homecoming. The film’s scope never limits itself to gays, or to homophobia. Whether interviewing novelists Lee Smith and Allan Gurganus, or talking to staunch supporters of Helms, or stopping passersby, Kirkman shows genuine interest in learning why Helms means so much to North Carolina, as well as what being a part of North Carolina means to himself. This constant introspection keeps the film from becoming spiteful…something we can’t say about the title character. The film quality isn’t always great, but that only adds to the “home movie” feel of the feature. Some viewers also complain about the attention Kirkman pays to himself; anyone expecting a nonstop exposé of Helms will probably share in that complaint. However, viewers who want an honest exploration of growing up gay in an anti-gay environment should enjoy this engaging project. Initially completed in 1998, Dear Jesse appeared on TV and on VHS, but Sovereign Distribution has just recently released it on DVD, adding bonus scenes and other special features. Visit http://www.sovereigndistribution.com/ to read more about Dear Jesse. Kirkman also directed The Night Larry Kramer Kissed Me and Loggerheads. The Night is simply a filming of David Drake’s acclaimed one-man play, while Loggerheads uses experimental story-telling to look at interconnected lives in North Carolina. Sound familiar? Doubtlessly, Kirkman’s experiences in small towns and the big city will lead to other interesting stories. Ballot Measure 9. Distributed by Sovereign Distribution. On Friday, February 1, 2008, a state law took effect in Oregon that allows gay couples to register as domestic partners. Though voted into law in 2007, it met delays from an Arizona-based group that wanted to block it. The group failed. Oregon previously banned gay marriage, after the state’s largest county briefly granted gay marriage licenses. Setbacks and advances for equality are nothing new for Oregon LGBTs; the DVD release of the documentary Ballot Measure 9 shows the dangers and the progress in disturbing yet inspiring detail. The timely return of this acclaimed film shows the true nature of hatred but also shows that love and equality can win out over fear and bigotry. Directed by Heather Lyn MacDonald and named for the bill it explored, Ballot Measure 9 received the Grand Jury Prizes at the Chicago GBLT Film Festival and the Los Angeles Outfest, the Audience Award for Best Documentary (Sundance Film Festival), and several other awards. Sadly, it remains as relevant today, since anti-gay groups still use the same lies and tactics shown in the film. Fortunately, we can learn their methods from the film, and the methods of those who defeated them. Though supporters of Ballot Measure 9 lied against and railed against gays, opposition slowly grew from within groups that weren’t limited to gay people or their parents—groups such as the elderly, African Americans, and people of faith. Many people saw the clear connections between hatred and discrimination, hatred and violence, hatred and past hatred. They simply said “enough” and helped defeat the measure. The law would not only have blocked any attempts at stopping anti-gay discrimination but also would have required schools to teach that homosexuality is “abnormal, wrong, unnatural, and perverse.” Its language set aside gays for special discrimination. Sadly, 9 wasn’t simply a bill that met political defeat. 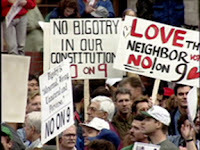 The hatred stirred up by its supporters led to an enormous increase in anti-gay violence, an increase that some of 9’s supporters actually blamed on gays. Still, like the group that recently tried to stop Oregon’s domestic partnership law, the anti-gay activists in 1992 failed. The documentary Ballot Measure 9 captures the fight and the hatred, but also captures hope and inspiration. MacDonald used hundreds of hours of footage to make a 72-minute film that carries emotional strength by exploring the words, feelings, and lives of Oregonians during the nine months leading up to the election. The long-awaited DVD version of Ballot Measure 9 (released January 29, 2008) includes several bonus features, such as a new 40-minute bonus documentary that updates viewers and reexamines the battle against 9. In that documentary, some of the opponents of the measure regroup to discuss how their experiences changed their lives forever, and to discuss how to defeat similar measures. Read more about this DVD at http://www.sovereigndistribution.com/. Degranon: A Science Fiction Adventure: Kindle Edition is currently #77 in Kindle Gay Fiction.